A new Ice age, the brainchild of a paramedic, is with us according to the Macmillan English Dictionary. 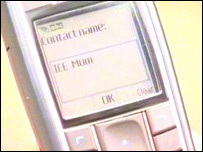 The term Ice, standing for In Case of Emergency, has already entered common English usage less than two months after the idea took off. East Anglian paramedic Bob Brotchie thought it would be useful if people used the acronym to store an emergency name and number on their mobiles. After the London bombings on 7 July, the idea has spread across the globe. Mr Brotchie, from Suffolk, has already been to America to promote the idea and is off to Australia and New Zealand to meet government officials. The Macmillan English Dictionary website listed the term under its "new words" section. Mr Brotchie said he could not believe it had happened so fast. "It would be amazing if Ice followed words like Hoover and Google into our everyday language - almost everyone you meet in the street has heard of it," he said.